Think beyond salads. A smoked vinaigrette can be used in a multitude of dishes. This tangy and sweet dressing gets a punch of smoke that pairs so perfectly with spinach. Smoke this vinaigrette in a mixing bowl or “go naked” by simply smoking the spinach raw. 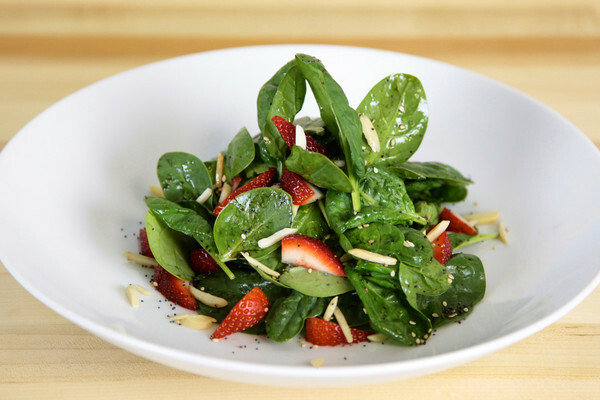 Smoked, raw spinach is a delightful addition to any salad. Combine vinaigrette ingredients in mixing bowl. Whisk to incorporate. Cover the top of the mixing bowl with plastic wrap and smoke with the PolyScience Smoking Gun™ for five minutes. Add enough smoke to form a thick cloud under the plastic wrap. After five minutes, release smoke and whisk to reincorporate smoke flavor. Toss spinach with vinaigrette. Divide into four salad bowls. Top with sliced strawberries and slivered almonds. Recently purchased a Smoking Gun, came across this recipe and glad I did. I used hickory chips instead of apple. Made the dressing a few hours and kept in the refridgerator before serving. Vinaigrette had a nice smoke flavor was a little sweet, might want to decrease the amount of sugar slightly. Pared well with steak with Chipotle butter. Will make again.